Posted: January 23, 2013 by Jackie R.
No matter where I hiked, deer tracks engulfed the snowy surface. In the creek bottom beside my cabin, these cervids created an intricate trail system, which they etched so carefully into the snow. Instead of blazing my own trail, I graciously utilized theirs. Also present on the snowy surface were tracks of the small, stealthy bobcat. 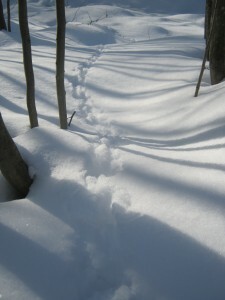 If not surrounded by endless woods, one would assume a wandering house cat may have left the prints. Grouse, squirrel, coyote, and rabbits all left behind evidence of their existence in the thick Pennsylvania snow as well. I wish I could know the exact times of their movements, but in the meantime I will continue to follow their tracks and pray that Mother Nature may spare these species through the harsh Pennsylvania winter. Did you know? Because of pectinations, which act like snowshoes on Ruffed Grouse’s feet, the birds will not sink into the snow.